Over the past few years, Miami has been the site of much culinary colonization. Several chefs with national reputations have set up outposts here; and as often as not, those outposts take the form of a steakhouse. 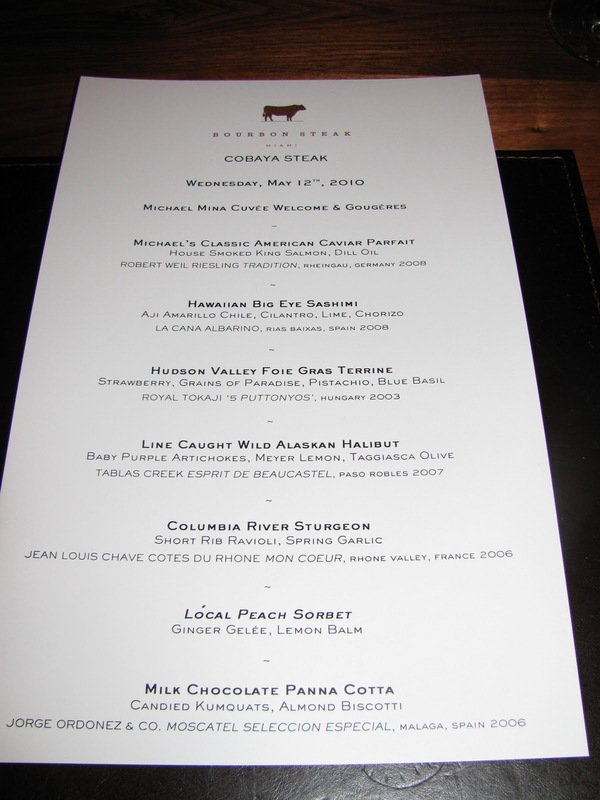 Michael Mina's Bourbon Steak, Alfred Portale's Gotham Steak, Laurent Tourondel's BLT Steak ... It's a formula designed to capitalize on the name while minimizing the execution risk as they put others in charge of carrying the brand's flag in the far-flung colonies: given the inherently limited nature of a steakhouse menu, diners will expect quality, but not necessarily the same creativity or flourishes by which these big-name chefs garnered their reputation in the first place. That's not to sell the steakhouses short. I've had some great meals at these places, and they have the capacity to serve as a springboard for younger kitchen talent (witness the nomination of Chef Sam Gorenstein of BLT Steak as a semifinalist for a James Beard Rising Star award this year). But the self-limiting format only gives so much wiggle room for the local chefs to show that they can do something other than grill a steak and cook potatoes. That's in part what Cobaya is for: to give chefs a chance to showcase, or experiment with, things they may not be able to do in their "native habitat." When we met with Bourbon Steak's chef Gabriel Fenton and general manager John Riccardo, we told them that this was a no-holds-barred opportunity to cook whatever they wanted to make, and if there wasn't a single piece of steak on the menu, that was perfectly fine. And Chef Fenton - who spent several years as executive sous chef at Michael Mina's flagship restaurant in San Francisco - put together a beautiful meal in which a cow made only the briefest cameo appearance. We hardly noticed its absence. Our group of 28 gathered at the Bourbon Steak bar (and a really fine bar it is, mixing up some of the best traditional cocktails I've found anywhere in Miami) where they passed around buckets of warm, light-as-air gougères, before being shepherded into a gorgeous private room to begin the dinner, where diners were handed flutes of bubbly (an Iron Horse Blanc de Blanc bottled for Michael Mina). 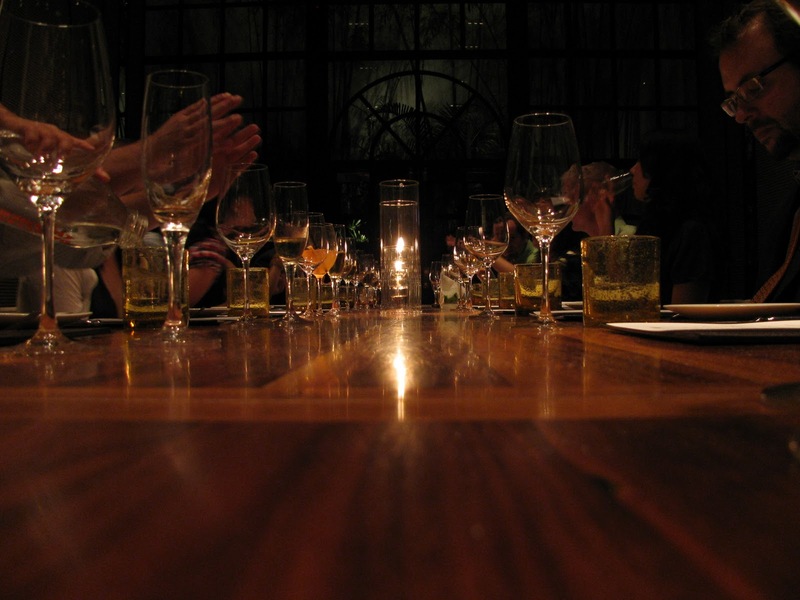 It was undoubtedly the poshest location for any of our dinners. But we're not about posh, we're about food. So on to it. 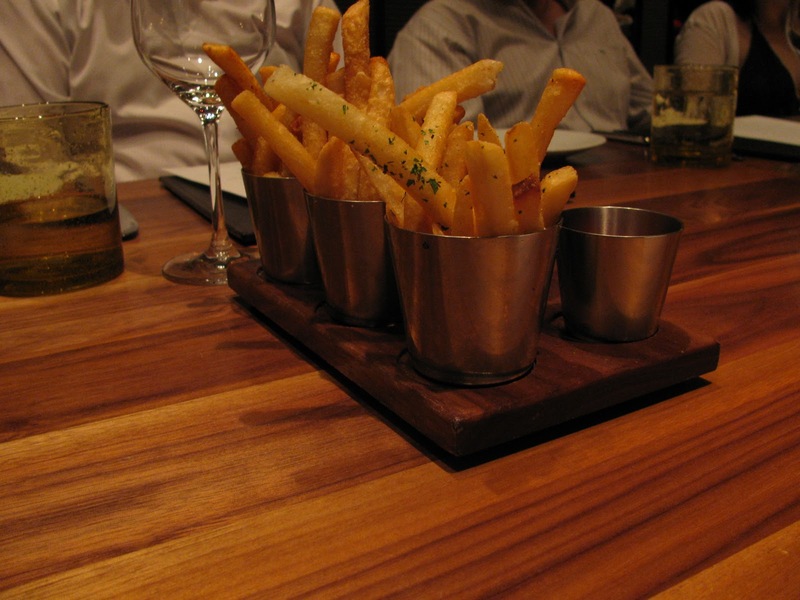 Every meal at Bourbon Steak starts with these: a trio of duck fat fries, tossed with three different herbs or spice mixes and paired with three different dipping sauces. While I encouraged Chef Fenton and his crew to break from their restaurant traditions for our Cobaya dinner, I was not remotely disappointed to see these hit the table. They are some of the best fries I have had anywhere. I suspect I had something to do with this particular item ending up on the menu. 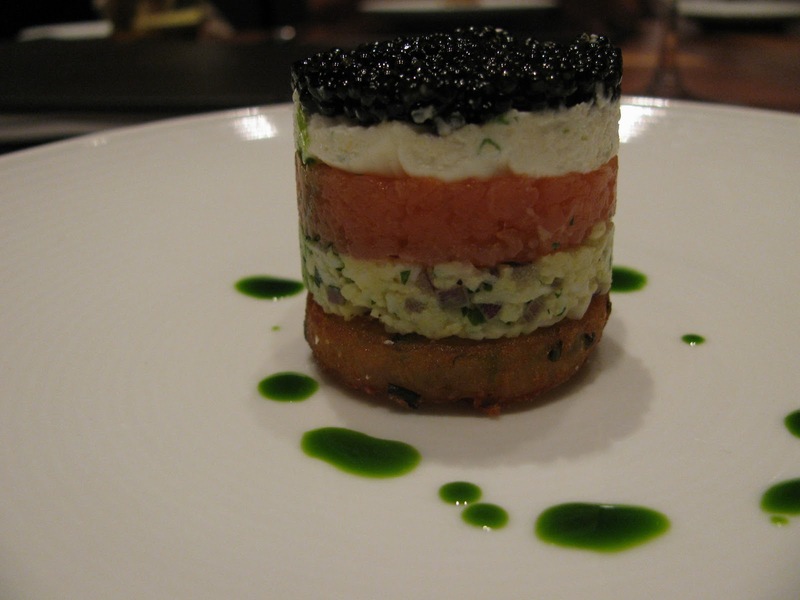 We were trading messages a couple days in advance of the dinner, and I happened to mention to Chef Gabe and John how much I'd enjoyed the caviar parfait, which was included on a Valentine's Day dinner menu they'd served at the restaurant. Lo and behold, it wound up on our plates for the Cobaya dinner. It's a wonderful little dish, combining all the traditional accompaniments for caviar: crispy potato cake, chopped egg with a bit of caper, diced house-smoked king salmon, creme fraiche, crowned with a layer of glistening American paddlefish (?) roe, the plate dotted with a fresh tasting bright green dill oil. Like the duck fat fries, this is another dish that is a classic from the Michael Mina repertoire (I came across a sweet little story that the origin of the dish was a "love letter" from Mina to his wife, created during their honeymoon). For the next dish, glistening crimson planks of Hawaiian big eye tuna were paired with a bright yellow sauce of aji amarillo (a Peruvian pepper), pickled onions, cilantro leaves, and puffy chicharrones rolled in chorizo powder. 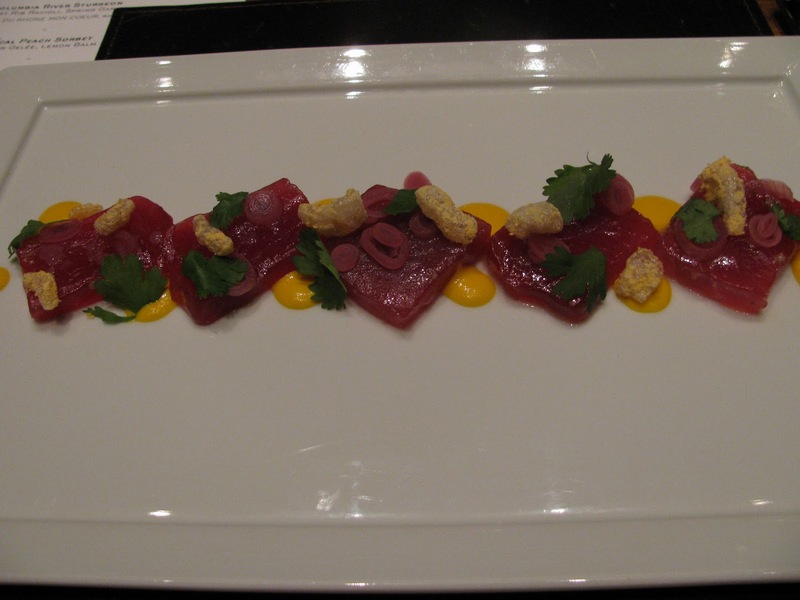 This was another great composition of flavors and colors. The fish was impeccably fresh and silky, and each other component provided a welcome balance of complement and contrast. 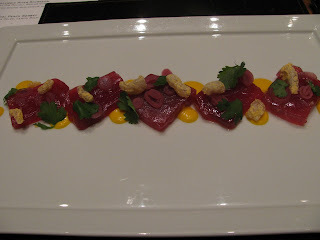 These kinds of raw fish compositions are making their way onto all sorts of menus, regardless of the ethnicity of the cuisine: Michael Psilakis offers about a half-dozen of them at the Greek/Mediterranean Eos, Scott Conant coyly calls them "susci" at Scarpetta, while most other Italian places all them "crudos." Whatever they're called, this was one of the most effective takes on the idea that I've tried, and I particularly enjoyed the contrast of the salty, lightly crispy chicharrones against the clean, fresh fish. A little insider's insight on this next dish. When I first saw a preview menu a couple days in advance of the dinner, this course was initially described as a foie gras terrine with a grape gelée, peanut streusel and brioche. A peanut butter, jelly and foie gras sandwich! Chef Fenton actually stuck with the original concept in the finished dish, though it might not have been recognizable if you didn't know the starting point. 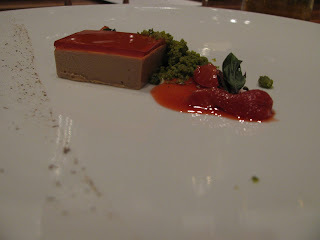 The final result was a luscious, creamy terrine of foie gras, topped with a cap of strawberry gelée, along with some pistachio crumbles, more macerated strawberries, sprigs of blue basil, and a dusting across the plate of grains of paradise (a/k/a melegueta pepper) for a little dash of piquancy. 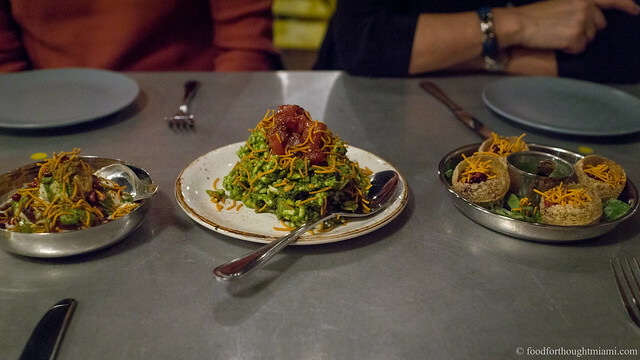 It's terrible writing form to keep using the same descriptor, but "composition" is the word that keeps springing to mind, as each of these dishes offered a precise, well-thought-out balance of flavors. I especially enjoyed how the strawberries and basil played against each other. This line-caught wild Alaskan halibut was plated with a ragout of baby purple artichokes, carrots, and pickled ramps, a silky purée of artichoke with a hint of smoky bacon, and a topping of a crumble of dried taggiasca olives. The fish was cooked perfectly, with a nicely pan-sautéed crispness around the edges, but still breaking apart in big moist flakes. 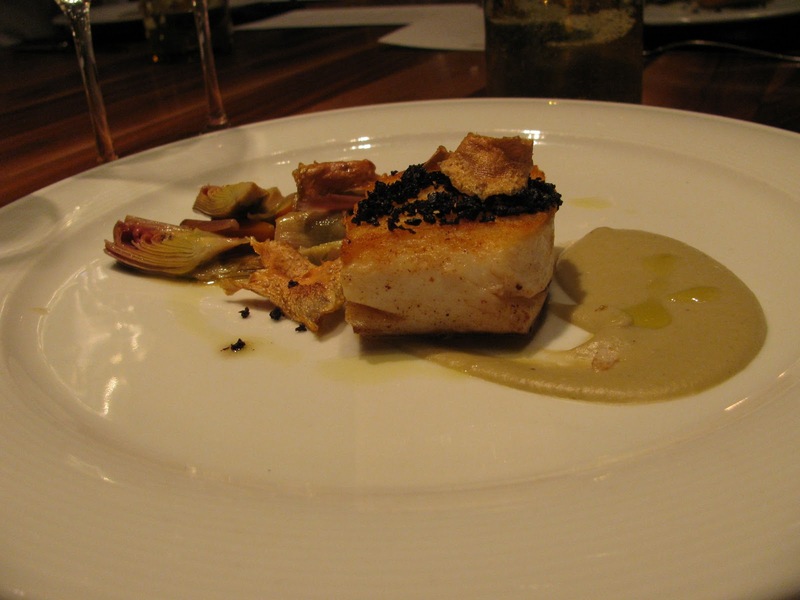 I often find halibut somewhat nondescript and underwhelming, but the vegetable pairings here, particularly the dense saltiness of the olives and the hint of smoke in the artichoke purée, really enhanced it. They also provided a welcome bridge for drinking red wine with the fish, and the Papapietro Perry Pinot Noir I got to try with it was one of those fortuitously perfect pairings. Here was our "beef" course for the evening: a tranche of Columbia River sturgeon, served with a short rib raviolo, in a veal jus scattered with spring onions, and topped with local arugula. 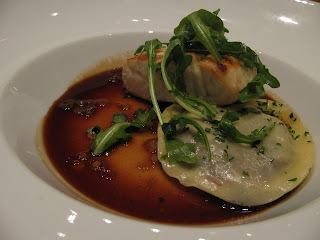 I enjoyed this take on a surf-n-turf, with the dense sturgeon offering an almost meaty texture to go along with the rich, tender pulled short rib in the raviolo, as well as the delicious, textbook veal jus. Sturgeon is not a fish you see often on menus, and it has a unique, earthy flavor which I thought worked well with the other beefy elements of this dish (though some may find it "muddy"). 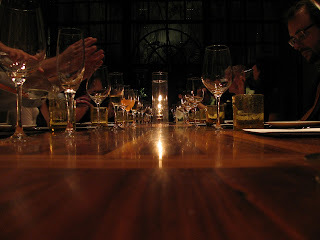 Those earthy, beefy elements proved a great match with a Cayuse Cailloux Vineyard Syrah from the Bourbon Steak cellar. 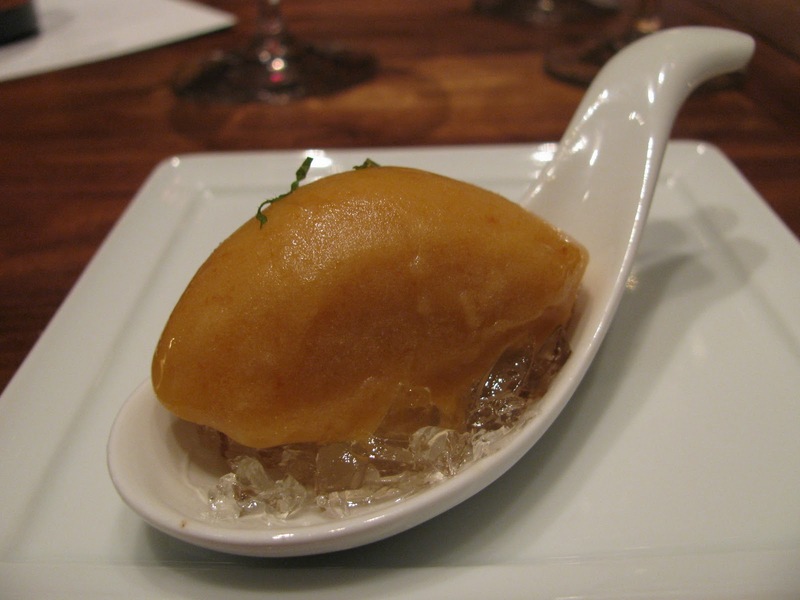 To make the transition to the sweet world, we were next served a peach sorbet, over tiny cubes of a ginger gelée, with a hint of lemon balm. I would have enjoyed a little more punch to the complementary ginger and lemon balm notes. The most intriguing element here was the "local" descriptor for the peaches. I never knew of peaches growing anywhere further south than Georgia, but there are new varietals that can grow in Florida's more southerly climes, and these are apparently sourced from somewhere in Northern Florida. There was much debate over whether this could properly qualify as a "panna cotta" - which, as accurately described by British critic Jay Rayner, should "wobble like a woman's breasts." Let's just say that as a "panna cotta," this could have used some lift and support. But setting aside nomenclature (maybe let's call it a "cremoso" like they do at Michael's Genuine), I thought it was a delicious dessert. 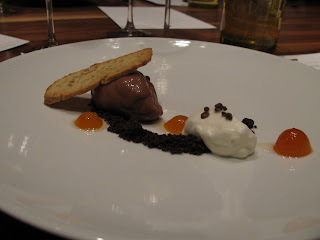 Of course, I am a sucker for the combination of chocolate and orange, and the pairing of the creamy milk chocolate with candied kumquats hit all the right notes for me, with some nice textural contrast provided by the chocolate crumbles, almond biscotti and cocoa nibs. Overall thoughts? Chef Gabriel Fenton has clearly learned his craft well from his work with Chef Mina. The ingredients were top-notch, the cooking technique was precise and meticulous, the composition of each dish was thoughtful and effective. It may not have been the most adventurous Cobaya dinner we've been served, but it may also have been some of the finest cooking we've experienced. It was interesting to me that Bourbon Steak is a place that wasn't on the radar of several of our Cobaya diners. Yes, it's a steakhouse, but it shouldn't at all be dismissed as "just a steakhouse." There's some seriously good food to be had here. I did not opt for the wine pairings and so cannot comment on them, other than to say that Sommelier Matthew Turner put together a really impressive lineup for $25, which included some of my favorites. I did, however, take advantage of the restaurant's generous offer to take 50% off their regular wine list prices for the evening (an offer that is currently available every Monday at the restaurant), as well as the generosity of a couple of our other diners who brought bottles with them. I sampled an elegant Alsatian Ostertag Grand Cru Riesling, a silky, smoky 1998 Chateau Pape Clement, a lovely, earthy Papapietro Perry Pommard Clones Pinot Noir that had all been brought out for the occasion, as well as, from Bourbon Steak's cellar, an intriguing 2006 Clos Uroulat Jurançon Sec Cuvee Marie and a smashing 2005 Cayuse Cailloux Vineyard Syrah. These sustainable seafood issues are so baffling. I have, mournfully, cut maguro and toro out of my sushi repertoire out of concerns that the bluefin tuna population is being depleted. And yet, while bluefin is at serious risk, bigeye tuna makes the Monterey Bay Seafood Watch "Good Alternative" list, provided it's caught with troll or pole-and-line, and not longline, gear (or comes from the Atlantic). And while I'd always assumed that all toro was from bluefin, it seems some comes from bigeye as well. It all makes my head hurt. This is actually a combination I recall having at Cyrus in Healdsburg, California a couple years ago. 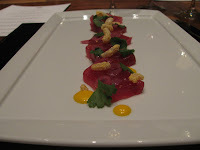 Chef Fenton said it was his first time cooking sturgeon other than one he and friends caught fishing several years ago. Let's not quibble over whether Northern Florida genuinely qualifies as "local" given the size of the state. It's still pretty cool. Aside from the regular menu, there's also a "Burger Bar" menu available in the lounge area and at the bar (and, perhaps, even in the main restaurant too if you ask nicely) and they serve some of the best burgers in town. Think about the kind of trimmings you can put into the grind when you're serving all those nice prime, dry-aged and wagyu steaks all the time. For further temptation, consider that they're currently offering the 50% discount off the wine list prices every Monday evening, and that Wednesday is "Bourbon & Blues" night with live music and 25% off any selection from their bourbons and whiskys. Looking good! Wish I was there. That is the briefiest beefiest menu from a steakhouse ever. Bourbon Steak looks fantastic, next time I am in Miami I will have to try it out. Thanks for such a great post.